Our diversity and inclusion initiatives have earned recognition from several leading diversity organizations and publications. Chevron was honored to receive the prestigious 2015 Catalyst Award, the premier honor for companies committed to expanding opportunities for women. In 2017, and for the 13th consecutive year, Chevron achieved a rating of 100 percent on the Human Rights Campaign Corporate Equality Index, which ranks U.S. companies committed to lesbian, gay, bisexual and transgender (LGBT) equality in the workplace. In 2017, Chevron received the Global Centre for Healthy Workplaces award in recognition of our leading health programs. The award recognizes that healthy workplaces impact business outcomes and can promote productivity, reduce absenteeism and improve employee morale. The National Business Inclusion Consortium named Chevron one of the 2018 top 30 American companies committed to diversity and inclusion for the LGBT community, people of color, women, and people with disabilities. Chevron was recognized by the World Institute on Disability in 2017 for its long-term leadership on employee disability issues. offer domestic partner benefits to employees. fully implement trans-inclusive health care benefits. include sexual orientation in its nondiscriminatory policies. achieve a perfect score for 13 years in a row in the Human Rights Campaign ranking of U.S. companies committed to LGBT equality in the workplace. Reinforcing the critical importance of diversity and inclusion to business performance, The Chevron Way holds everyone accountable in advancing diversity at all levels of the company. Many of our more than 45,000 employees, including the CEO, have diversity action plans as part of their annual performance evaluation. More than 15 diversity councils are focused on promoting diversity and inclusion at Chevron. Council members serve as resources for members in their respective organizations to help align diversity plans with business strategies. Chevron was honored with the Catalyst Award for efforts related to attracting, retaining, developing and advancing women at Chevron. Hear from executives and employees about the company’s 20-year journey to increase diversity and inclusion in the workplace. Diversity and inclusion are cornerstones of The Chevron Way values and are critical to ongoing business success. An inclusive work environment that values the diversity of our employees’ talents, experiences and ideas, leads to more innovation and ultimately higher performance. The Chevron Way’s focus on people has helped establish a culture that attracts, develops and retains more diverse talent. Partnering is critical to our success in attracting talent – we partner with governments, communities and educational organizations across the entire educational pathway. We build trusting and mutually beneficial relationships with strategic partners and are most successful when our partners succeed with us. Our relationships and programs with historically black colleges and universities are designed to encourage minority participation in science, technology, engineering and mathematics (STEM). Over the past few years, we have worked with our university partners to help them improve their diversity and inclusion efforts. Since 2015, engineering deans from more than 200 universities have signed a pledge and committed resources to improving opportunities for women and underrepresented minorities, the retention of students, and the inclusivity of the environment at their universities. We work with them to develop programs to address diversity and inclusion issues, and we partner with the American Society of Engineering Education to convene groups to leverage our efforts. We also partner with diversity associations such as the National Society of Black Engineers (NSBE), the American Indian Science and Engineering Society, the Society of Hispanic Professional Engineers, Great Minds in STEM, Society of Women Engineers, INROADS, and the National Action Council for Minorities in Engineering to develop programs that will help provide opportunities for students. Chevron’s Diversity Scholarship Program disburses $750,000 in scholarships annually through seven partner organizations. In 2017, 121 scholarships were awarded to students, 55 percent of whom were female and 88 percent of whom were diverse. We currently have a pilot program underway with the National Association of Engineering Program Associates and Purdue Women in Engineering to improve math proficiency in African-American communities. We support the NSBE’s Summer Engineering Experience for Kids (SEEK) camps in Houston, Texas; New Orleans, Louisiana; and Oakland, California. The mission of SEEK is "To increase elementary school students' aptitude in math and science and their interest in pursuing STEM (science, technology, engineering, math) career fields, by having them engage in interactive, team-based engineering projects." To help improve opportunities in STEM education for young girls, we convened sessions with the National Science Foundation, NBC Learn, and more than 15 professional and diversity associations to develop the Women in Engineering Educational Outreach and Training curriculum to arm teachers with materials on engineering that will help expand the pipeline of talent. We have an incredibly talented workforce willing to share its knowledge in our various mentorship programs. All employees have the option to find a mentor on their own or with the help of a supervisor, through programs specific to their business unit. Our employee networks also offer formal mentoring programs. Aligning with our diversity goals, employees define measurable objectives they will be accountable for – and graded on – as a part of our annual performance evaluations. These plans can be tied to compensation and help achieve our vision of diversity. To promote diversity and inclusion, we host more than 15 diversity councils across our business units and corporate functions that actively support our strategic approach to diversity. To help ensure that our employees understand our policies and know how inclusion is practiced throughout our company, we provide opportunities such as diversity training, guidance on personal diversity action plans and lunchtime diversity learning sessions. In 2017, more than 19,000 employees – nearly 40 percent of our regular workforce – participated in Chevron’s employee networks that celebrate and promote diversity. These networks act as a resource for attracting and retaining talent and enhance Chevron’s reputation through community activities and outreach. They also provide formal mentoring programs and offer opportunities for skill building and career development. MARC is a Catalyst initiative created for and led by men and women in partnership to achieve gender equality through workplace inclusion. 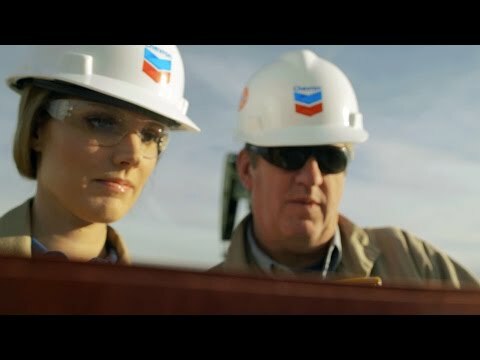 In 2017, the Chevron Women’s Network and now-CEO Mike Wirth brought MARC programming to Chevron, beginning with a pilot in Houston. Chevron’s MARC program now includes more than 750 employees in seven Chevron locations globally, with additional growth planned. In 2017, we spent more than $600 million on goods and services from woman- and minority-owned businesses in the United States. We spent more than $1.6 billion on goods and services from U.S.-based small businesses. Our employee networks bring essential value to the business. In 2017, more than 19,000 employees – nearly 40 percent of our regular workforce – participated in our employee networks. Adriana, who works in information management, talks about the importance of diversity and inclusion within the company and how it affected her decision to work at Chevron. To strengthen organizational capability, we develop our employees’ and contractors’ skills and experience through our Invest in People strategy. As part of our Invest in People strategy, discussions focused on continually improving individual performance are held between managers and employees. In 2017, our eligible employees completed these performance discussions and set annual developmental objectives. Skill development occurs at each stage of our employees’ careers. For example, all new employees are expected to participate in the onboarding learning journey – including the New to Chevron workshop – within their first six months on the job. In 2017, 90 percent of new hires met this goal. Our Horizons program is an accelerated development program that builds the technical competency of employees who have fewer than six years of industry experience. More than 2,100 employees were active in Horizons in 2017. Chevron strives to communicate openly with our more than 45,000 employees. In addition to our annual Worldwide Employee Town Hall, business units around the globe conduct town hall forums and meetings, addressing topics such as safety and business performance, as well as engaging with employees on a wide variety of other topics. We’re promoting an inclusive business environment, one supplier at a time. Our values distinguish us and guide all of our business activities and decisions. Our respect for human rights is rooted in our values and applies wherever we do business.